Does whisky improve your health? Some, dishonestly, claim it does. Recast numerous times, vetted by health authorities and lawyers, the text concerning Sláinte never satisfied Bill Lark—who intimated that the words were actionable. In 2017, however, the contentious health claim on the label was removed. The publisher then argued that the new label made the old story moot and it was not published—or, rather—the first half was published, but the later paragraphs were redacted, leaving readers with the impression that Slainte is a health drink. Drambuie traces its origin to the 1740s, but it had precursors. Monks were infusing alcohol with herbs to create medicinal tonics in the 13th century. Drambuie also has many imitators. Local alcoholic “cordials” flavoured with cinnamon, cloves and nutmeg were made by Van Diemens Land distilleries in the 19th century. At the Tasmania Distillery in the 20th century Lyn Lark made a liqueur whisky named Golden Age. Bill Lark wanted a Lark whisky liqueur and once his distillery had enough stock to blend with he asked Lyn Lark to experiment. She created Sláinte in the 21st century, its debut year was 2005. Because it is illegal in Australia to suggest any health benefit for a product that contains alcohol, that sentence on the label is not to be read as a therapeutic claim nor should you assume that it is about your health. It is not—it is just a cheering thing to say. ‘The name is intended to be light-hearted,’ Bill Lark told me. The Cancer Council of Tasmania is not laughing. It asserts that alcohol is itself a carcinogen. Even in small amounts “there is convincing evidence that drinking alcohol increases the risk of cancers in the mouth, pharynx, larynx, oesophagus, bowel and breast”. The World Health Organisation puts alcohol in the same class of carcinogens as plutonium and asbestos. Cheers. 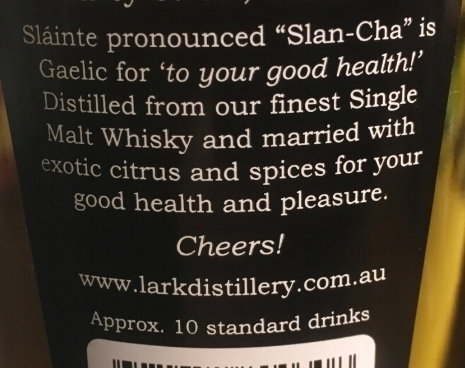 In 2017 the Slainte label was changed (making the previous black labels collectible) and the “good health” sentence was removed; however, the central claim subsists is in the product name which remains unchanged. * In 2018 another major health study concluded that the negative health impacts of drinking alcohol outweighed all the minor health benefits in all cases.